HARLEM The family of Ramarley Graham had been advised to move from Harlem to the Bronx by community leaders who feared they had become the target of an NYPD harassment campaign. The advice was given just a couple of months before Graham was shot dead in his bathroom by an officer. On July 25, 2010, a police cruiser pulled up outside the Harlem home of Ramarley Graham’s father, Franclot Graham, who lived with Ramarley’s stepmother, four brothers, and grandmother at 131st Street. 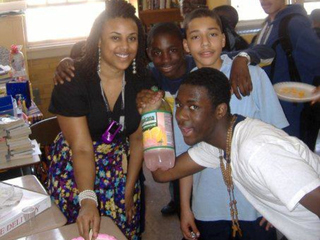 Ramarley, who was not present, lived in the Bronx with his mother, Constance Malcolm. The boys’ grandmother tried to usher the teens inside. Then all hell broke loose. The teens said they were beaten, maced and knocked unconscious, according to a civil lawsuit filed against the the city and officers from the 32nd precinct. Officers used batons and mace to enter their apartment without a warrant, they claimed. The Harlem community alleged that the incident was part of a pattern of harassment against the family and held a meeting at the Nation of Islam’s No. 7 Mosque to address the issue. UNION SQUARE For Lower East Side artist Gianberto Vann, the ostrich egg a behemoth work of nature weighing up to three pounds has long inspired some of his most adventurous dinner parties. 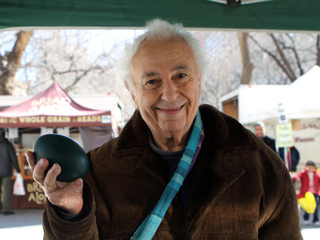 That was until this past Monday, when Vann, 81, bought his first emu egg. Dark green and black on the outside, and creamy on the inside, the egg first caught his eye as it glinted in the sunlight at the Roaming Acres Farm stand in the Union Square Market. Ever the adventurous cook, Vann couldn’t help but buy the six-inch, nearly two-pound egg which he planned to serve scrambled with shrimp and bacon alongside his duck breast entree. Vann hasn’t been alone in his quest to try the highly sought after, and very expensive, emu egg, according to Roaming Acres Farm salesman Lou Braxton. 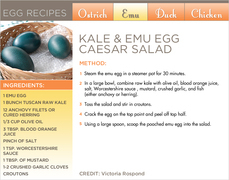 Despite their $20 price tags, emu eggs have soared in popularity in the past year as both amateur and professional chefs seek the next big thing to spice up their kitchens with the exotic and colorful novelty. The workers say most in their jobs are denied minimum wages, overtime and sick pay, and must use caustic chemicals without protection. THE GENERATION GAP: The new issue of City & State spotlights the generation gap in Brooklyn politics, where an aging black leadership faces new challengers (http://bit.ly/A9ba9w), focuses on how New Yorks resistance to raising tolls complicates transportation repairs (http://bit.ly/xK83Sc), and highlights City Council photographer William Alatristes unique view of government (http://bit.ly/wEp2qG). Read the full issue at www.cityandstateny.com.